The in-home sports viewing experience is better than ever. Fans can now see players up close in HD, watch instant replays of critical calls, and replicate the sense of community inherent in a live venue through social media — texting friends about the game, sending snaps, and checking Twitter to see what other people are saying. The improved in-home experience paired with the high cost of tickets, however, can be a barrier to drawing large crowds in person. To coax fans off their couches and into stadiums, sports organizations are redefining the live experience and finding new ways to engage with audiences — starting with bridging the physical and digital viewing experience in the venues themselves. 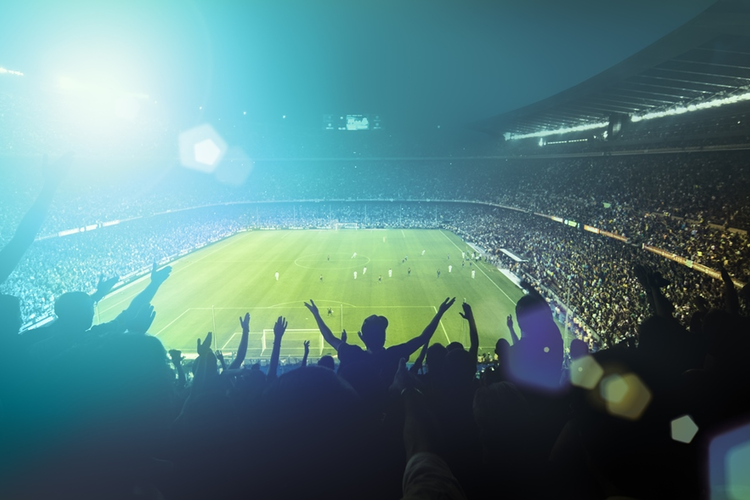 The Internet of Things (IoT) is elevating stadiums from mere physical structures where people convene to centralized data hubs powering interactive experiences. By harnessing immense amounts of raw data about their fans, teams can track behaviors in order to create personalized experiences in the form of player interactions, live game updates, rewards programs, and special offerings based on purchase history. Fittingly, the first “smart stadium” popped up near Silicon Valley. Levi’s Stadium, home to the San Francisco 49ers, is equipped with 12,000 physical network ports and a 40-gigabit Wi-Fi network to keep fans, features, and stadium operations connected at all times. Fans using the stadium’s mobile app can watch multiple-angle instant replays on their smartphones, order concessions from their seats, and even track which restroom has the shortest line in real-time — all made possible by 1,700 Bluetooth-based beacons that recognize fan locations throughout the venue. Not too far from Levi’s Stadium, the Sacramento Kings’ Golden 1 Center has future-proofed itself by centering its functionality on software, rather than hardware. Instead of having to alter the physical construction of the arena any time there’s new technology available, a 6,000-square-foot data command center can undergo software updates, providing greater flexibility for rapid advancement. Kings fans can enjoy a highly personalized experience before they even arrive on site — arranging Uber rides and reserving parking through the stadium’s app, for instance. Once they pass through the “smart” turnstiles, which use retina, fingerprint, and facial recognition for safer, seamless entry, fans can use the app to find their seats, track lines, order food, follow live stats and coverage, and even ask an AI messaging bot questions about the game. Not only do fans get to enjoy the sense of community that comes with being in a stadium, they can also share it with friends and family elsewhere. The center’s 650 miles of fiber optic cable and more than 300 miles of copper wire let fans send 500,000 snaps per second — because the best kind of advertising, of course, is word of mouth. What’s Next for Smart Stadiums? Smart stadiums like the Levi’s Stadium and the Golden 1 Center aren’t the exception; they’re becoming the rule. According to architect John Rhodes of HOK, the firm behind the Atlanta Falcons’ new Mercedes-Benz Stadium (whose 360° halo video board is the largest in the world), “[The] NFL has become an arms race” of increasing connectivity and removing barriers between digital and physical worlds. In the not-so-distant future, fans could even be watching 3D holographic representations of players on the field or court, essentially enabling viewers to watch away games at their home stadium. In fact, in its bid for the 2022 World Cup, Japan promised to do this for every game. Sporting events have always been about community — flipping your cap inside out to rally from behind, and high-fiving the person next to you when your team scores. People crave experiences and human connection, but in the digital age, they’re nearly starved of it. The most innovative teams are the ones giving their fans a reason to gather, and the IoT is leading this next wave of engagement.